Marcus Junius Brutus (also known as Q. Caepio Brutus) was convinced by Decimus Brutus to join him in the assassination of Julius Caesar on the Ides of March (March 15th, 44B.C.). All in all Julius Caesar suffered over 50 wounds before falling dead beneath the statue of Pompey the Great (ironic as that was his rival). Mark Antony was held up outside the senate house while this happened, so he could not come to his aid. After the death of Julius Caesar, Mark Antony gave a famous funeral speech in honor of Julius Caesar in which he read the deceased man’s will, in which he left vast sums of money along with lands to the people of Rome. The sentiment quickly turned against the assassins, even though they were first consider heroes riding the Republic of a “tyrant” and Marcus Junius Brutus, Cassius and many others were forced to flee the city of Rome quickly. This left the city of Rome under the control of Mark Antony and Octavian, later known as Augustus, who was adopted as the son of Caesar in his will. This meant that Augustus was able to use the fame of Julius Caesar to his advantage, and stamp CAESAR on his coins, which allowed him to gain support. The forces of Mark Antony and Octavian Augustus defeated the forces of Brutus and Cassius at the Battle of Philippi in ancient Macedonia, in 42 B.C. Depicted in this article are the coins of some of the most famous assassins, one of them being Deciumus Brutus, lesser known to history, but had played an important role in convincing Marcus Junius Brutus to join his cause. Decimus Brutus received great honor serving under Caesar in his Gallic campaigns (Gaul being modern France area). He also is the one who convinced Julius Caesar not to heed the warnings of his wife, and walked him into the senate house, evading Mark Antony from joining them (who could have came to help Caesar and could have foiled the attempt). Julius Caesar was also warned by a trusted friend by the name of Lepidus the night before of the plot. Next a coin is shown which is the famous portrait coin of Julius Caesar that was struck fore about a month which featured the portrait of Julius Caesar himself, struck February-March 44 B.C. This being a lifetime portrait issue is one of the important key coins to get in the Julius Caesar coins. His portrait was used on many coins after his death, including by Augustus and Mark Antony. This coin broke the conventions of portraying a living individual on coinage, which strong Republican sentiment was against, having taken away the power of the last king hundreds of years earlier. 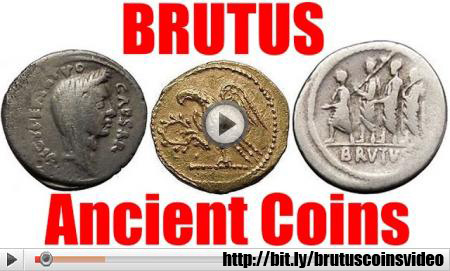 What is interesting to note is that Brutus winds up minting his own coin with his own portrait, which is another key coin, shown in the video, which can be taken as somewhat hypocritical. The explanation goes on further to distinguish the coins of Marcus Junius Brutus from the time period of him being the moneyer of the mint of Rome which happened in 54 B.C. In this series, his strong republican values are demonstrated, pointing to his ancestors who were responsible for bringing Rome from the rule of kings to the Republican form of government. His later issues are ones issued by him with his traveling military mint he used his troops. These coins are also interesting, rare and desired by collectors. The most famous coin being the Ides of March denarius, which features the portrait of Brutus on the front naming him Imperator, and the reverse showing the cap of liberty with two daggers on either side, and an inscription below commemorating “IDE MAR” or the Ides of March and the assassination. This was an allusion the the “great deed” that Brutus and the assassins had done for the saving of the Republic. However after Brutus and Cassius were defeated, Augustus wound up becoming the first Roman emperor, turning Rome from a Roman Republican form form of government to a dictatorship with the ceremonial vestiges of the Senate being present, and the true power residing in the emperor. Silver Denarius 19mm (3.26 grams) Rome mint, 48 B.C. A . POSTVMIVS COS, bare head of the consul, Aulus Postumius Albinus right. ALBINV BRVTI F in wreath. Decimus Junius Brutus was one of the assassins of Julius Caesar in the conspiracy of 44 B.C. He was adopted by A. Postumius Albinus and joined his own name with that of his adoptive father. He should not be confused with the more famous M. Junius (or Q. Caepio) Brutus. This moneyer received many marks of praise from Julius Caesar when he served under him in Gaul. This coin features the portrait of the moneyer’s adopted father. P . SEPVLLIVS MACER, Venus Victrix standing left, holding Victory and scepter, star set on ground to right. Silver Denarius 17mm (2.33 grams) Rome mint: 54 B.C. BRVTVS behind head of L. Junius Brutus, the Ancient. AHALA behind head of Caius Servilius Ahala. Silver Denarius 21mm (3.55 grams) Rome mint: 54 B.C. Head of Libertas right; behind, LIBERTAS. L. Iunius Brutus walking l., between two lictors and preceded by an accensus; in exergue BRVTVS. Silver Denarius 17mm (3.30 grams) Struck 43-42 B.C. Military mint traveling with Brutus and Cassius in western Asia Minor or northern Greece. P. Servilius Casca Longus, moneyer. CASCA behind, LONGVS before, laureate and bearded head of Neptune right; trident below. BRVTVS behind, IMP before, Victory advancing right on broken scepter, holding palm frond in left hand over left shoulder and broken diadem bound with fillet in both hands. Silver Denarius 18mm (3.16 grams) Late summer-autumn 42 B.C. Military mint traveling with Brutus and Cassius in western Asia Minor or northern Greece; Pedanius Costa, legate. Laureate head of Apollo to right; LEG upward to left, COSTA downward to right. Trophy composed of cuirass, crested helmet, oval shield with incurved sides, and two crossed spears; IMP upward to left, BRVTVS downward to right. Silver Denarius 19mm (3.50 grams) Spring-early summer 42 B.C. Military mint traveling with Brutus in southwestern Asia Minor. L. Sestius, proquaestor. L. SESTI . PRO . Q, veiled and draped bsut of Liberty right. Q . CAEPIO BRVTVS PRO COS, tripod between axe and simpulum. Gold Stater 18mm (8.86 Grams) Struck After 44 B.C. Silver Denarius 18mm (3.35 grams) Summer 40 B.C. ANT . IMP . III . VIR R . P . C ., his bare head right, lituus behind. CN . DOMIT . AHENOBARBVS IMP., prow, star of sixteen rays above. Amyntas – King: 36-25 B.C. Bronze 24mm (8.89 grams) Struck circa 36-25 B.C. Head of bearded Hercules right, club at neck; II / Є behind. Nemean Lion (the astrological zodiac sign of Leo and the constellation) standing right; B above, monogram (of AMYNTOY) in exergue. Amyntas was a secretary of Deiotaros. He was in the military service commanding an auxiliary force in the Roman army of Brutus and Cassius. Having gained the favor of Mark Antony, because he had gone over to his side before the Battle of Philippi, Antony granted him an extensive kingdom which included Galatia, Lycaonia and parts of neighboring territories. Having deserted Antony in a timely manner to Augustus, he secured the patronage of Augustus. After having perished in battle in 25 B.C., his kingdom became a Roman province. Silver Denarius 20mm (3.74 grams) Pegamum mint: 27 B.C. AVGVSTVS, bull standing to right. Fascinating article about numismatic coins. World-renowned numismatic expert created this to teach.